SUBHEAD: Army Corps of Engineers sent back to analyze the environmental justice of the Dakota Access pipeline. Image above: More than 380 tribes around the world came forward to stand with the water protectors. Photo by Vlad Tchompalov.From original article. On July 27, 2016, the Standing Rock Sioux filed a lawsuit against the Army Corps of Engineers for authorizing the construction of the 1,172-mile Dakota Access pipeline. Just over a year later, the project has been completed and carries crude oil from North Dakota’s Bakken oil fields to an export terminal in Illinois. The case is still pending, and continues to be the tribe’s last hope to protect its water and land. The lawsuit alleged that authorization of the pipeline violated the Clean Water Act, Rivers and Harbors Act, and the National Environmental Policy Act by failing to adequately conduct an efficient environmental assessment and skipping an environmental impact statement (EIS) altogether. The lawsuit has now been joined by the Cheyenne River Sioux and the Yankton and Oglala Sioux tribes, but at its heart, the case remains the same since its initial filing, said lead attorney Jan Hasselman, who represents the Standing Rock Sioux on behalf of nonprofit environmental law firm Earthjustice. He’s been arguing that the $3.8 billion energy project ignores treaty rights and needs further environmental review. The goal is that U.S. District Court Judge James E. Boasberg will rule in favor of an EIS and pause pipeline operations indefinitely, and, ultimately, stop them completely. In December, pipeline opponents almost secured the EIS under former President Barack Obama when the Army Corps of Engineers announced it would prepare the statement and not permit the pipeline to cross beneath the Lake Oahe crossing on the Missouri River, an area of cultural, religious, and spiritual significance to the tribe. It was a near victory. With the EIS secured, the court shelved the lawsuit, but there was more bubbling beneath the surface. Dakota Access launched a counter lawsuit once the Obama administration requested the EIS, and Donald Trump’s presidential inauguration loomed on the horizon. The lawyers, the tribe, and even the court knew the situation could change drastically. “The court was pretty explicit that this could be undone,” Hasselman said. And it was. Trump rescinded the EIS and issued the final easement across Lake Oahe in February. Immediately, the attorneys amended their initial complaint to include the final easement. Things moved along quickly from there, Hasselman explained. For the first time, the tribe had something concrete to contest, not something they were asking the courts to prevent. 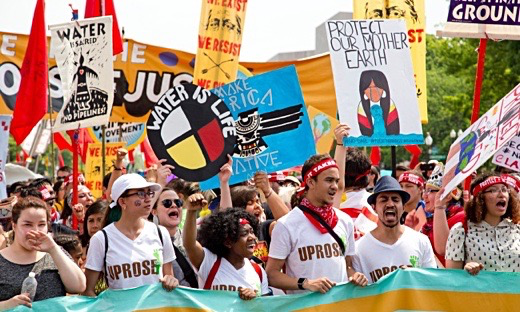 Then in June, Judge Boasberg found that the Corps had not sufficiently considered the pipeline’s environmental effects or environmental justice impacts when issuing its permit, and remanded the case back to the EIS process to reconsider its analysis. This is the first time Earthjustice is aware of such an environmental justice ruling. Boasberg’s recent decision offers DAPL’s opponents hope, but a favorable outcome is anything but assured. A pipeline has never before been stopped with a lawsuit, Hasselman said. “The legal and regulatory infrastructure is badly broken. You just don’t have the big overarching federal permits for a crude oil pipeline that you have in a lot of other contexts.” Unlike natural gas pipelines, the Federal Energy Regulatory Commission regulates a pipeline’s terms and conditions of transport, but not its actual construction and operation. Earthjustice didn’t take up the case because it believed the court held the answer but, rather, because it recognized the political power such a case could build. To that end, it has surpassed expectations. “What I had in mind was substantially more modest than what happened,” Hasselman said. He had hoped that 50 people would show up to court and they’d end up on the evening news. He wasn’t expecting the iconic fight for indigenous sovereignty that Standing Rock has become. The Dakota Access pipeline is now a matter of global interest. More than 380 tribes around the world—from New Zealand’s Māori to the Ecuadorian Amazon’s Kichwa—came forward to stand with the water protectors. “That’s a very significant time in history: when the tribes come together collectively and unite and say, Enough is enough,” Archambault said. The tribe’s effort became a movement with the support of spirit and prayer camps outside the reservation—including the Sacred Stone and Oceti Sakowin camps—and a 1,500-mile run to Washington, D.C., in which about 30 Native American youth delivered a petition with more than 140,000 signatures to the Army Corps headquarters demanding it halt the pipeline’s construction. Although this attention hasn’t influenced the lawsuit, Hasselman said, it legitimized the movement. Once the world set its eyes on Standing Rock, it could no longer ignore that the historic violent treatment of indigenous people isn’t a thing of the past—it continues today. Now? Hasselman thinks they have a shot. “We have an uphill struggle in persuading the court to shut down the pipeline while the remand process is underway, and we have an uphill struggle persuading the Army Corps to do a legitimate and appropriate analysis on remand, but we’re all working 24/7 to make that happen,” he said. Judge Boasberg is set to decide in September whether to pause pipeline operations while the Corps continues its review, and court proceedings are ongoing as both parties make their arguments. Until then, the tribe will see its challengers in court.